In the center of the Bavarian town of Bad Aibling lies Marienplatz, a historic plaza flanked by public, retail and hotel buildings. It is here that the two main streets of the town intersect and where the existing town hall from the 1970s has stood. 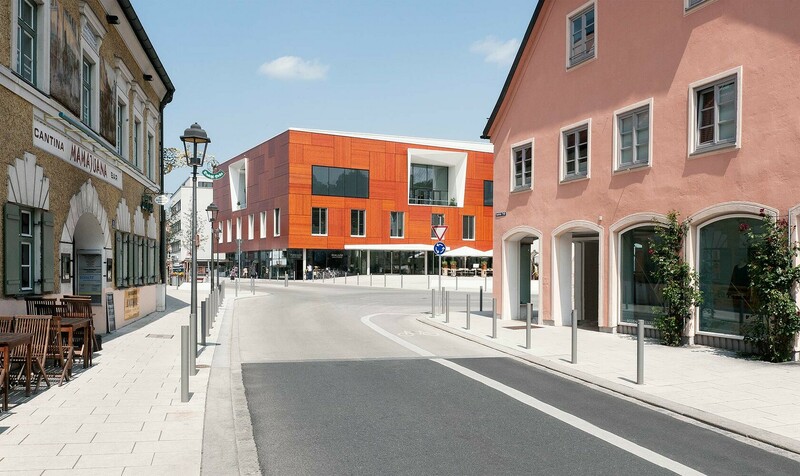 In recent years, the town of Bad Aibling decided to construct a new hall as a means by which to further invigorate the centre. The old hall was demolished down to the cellar level. Keeping the cellar and the building foundations intact was part of the client’s brief for the project, and therefore a key constraint in planning. The new building has been erected on the foundations of the existing hall, respecting the pre-determined load-bearing capacity of the cellar and foundations as well as the existing supply network. The planning team chose a lightweight construction for this reason, construction that consisted of a concrete skeletal structure with wood-clad walls. The new town hall accommodates primarily public functions. It is designed as a multi-functional venue that houses a variety of programs – including space for citizens’ services, administrative offices, meeting rooms, as well as a public library and a registry for weddings - all under one roof. In addition, part of the project brief was to vitalize the ground floor level of the city centre. This was accomplished through the integration of retail program at ground level, consisting of shops and a café. Their presence here has transformed this public space into an environment that is lively and engaging both during and after business hours. The entrance of the town hall from Marienplatz leads into an atrium that hovers above the storeys. From here, visitors can circumnavigate the building and experience it as a truly public space - a flowing, communicative public thoroughfare for casual and planned encounters. 4.300 qm / 46,285 sq.ft. 15.000 cbm / 529,625 cu.ft.